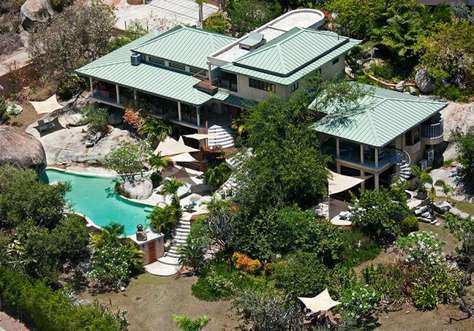 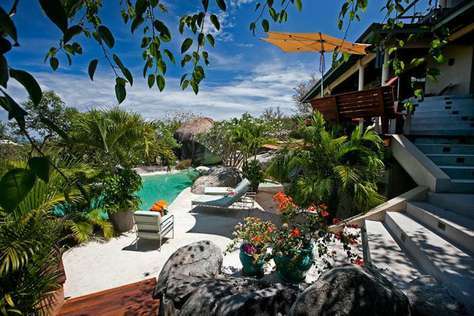 Symbio is a luxurious ultra-modern Virgin Gorda villa set within a private estate in Princess Quarters. 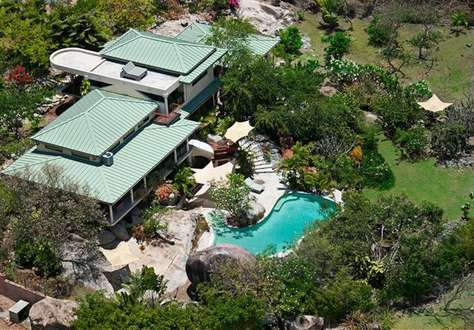 This truly spectacular two bedroom villa is minutes away from the historic Coppermine, The Baths and numerous white sand beaches. 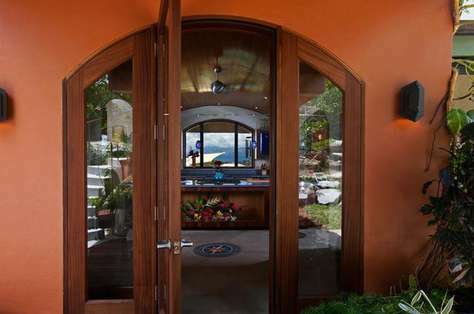 Spectacular sunset views, cooling Caribbean breezes and luxurious amenities make a stay at this Virgin Gorda villa a perfect vacation in paradise. 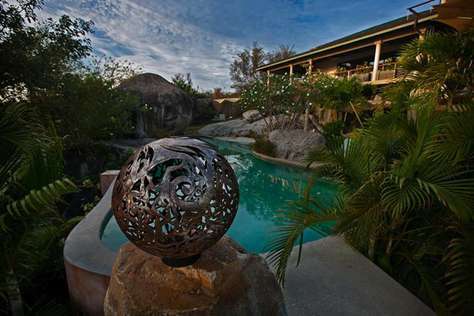 Symbio was designed to co-exist in perfect symbiotic harmony with the natural elements of Virgin Gorda. 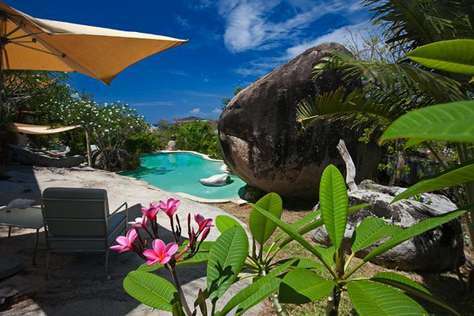 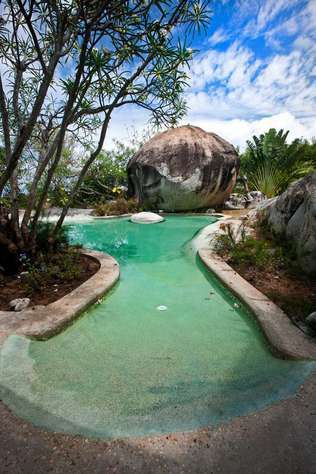 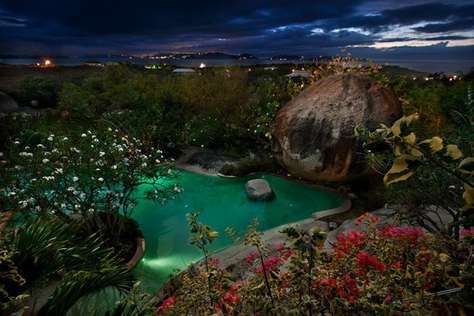 The gigantic granite boulders, characteristic of The Baths, surround this Virgin Gorda villa, its tropical gardens and salt water pool allowing for seclusion and privacy. 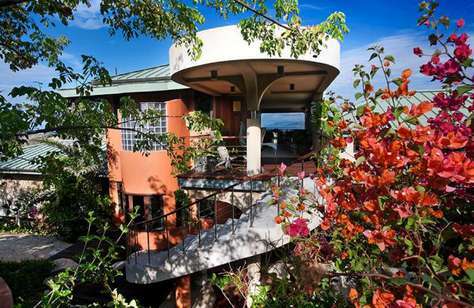 The villa has three levels. 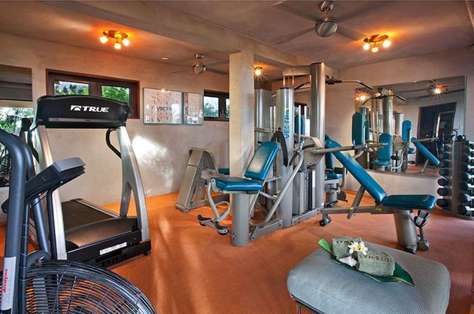 On the entry level are the common reception, dining and entertainment areas. 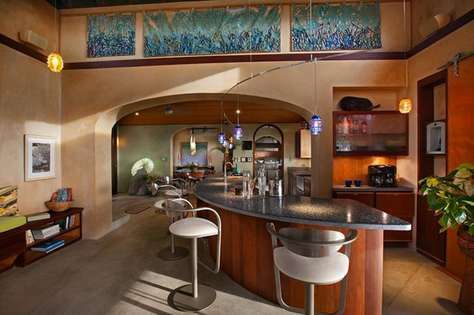 There is a fully equipped Viking kitchen as well as a grill kitchen also on this level. 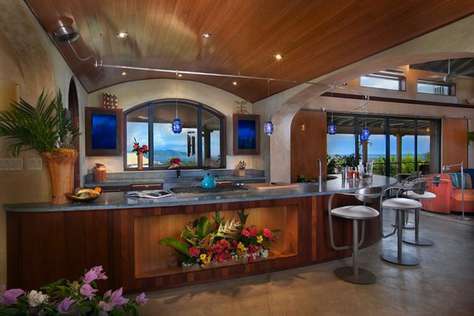 The layout of the kitchens with a beautiful sea view in the background and a wrap-a-round circular counter make it perfect for shooting a cooking show, hosting catered affairs, families or small group retreats. 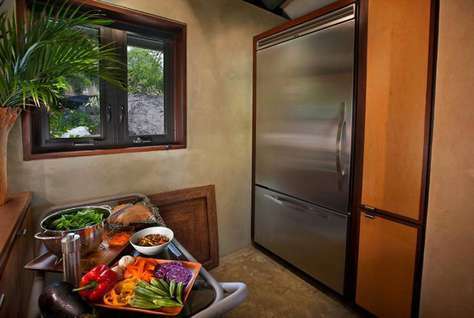 The primary kitchen is sleek with its double refrigerated drawers, long wrap-around counters and stainless steel appliances. 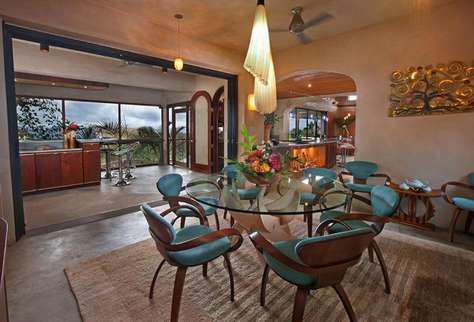 Bar seating for foru encircle the primary kitchen which flows to the formal dining area with seating for eight. 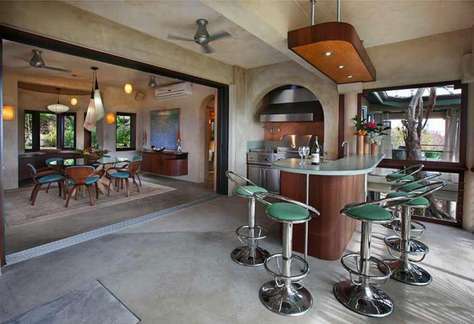 Flowing outwards is the attached open air grill kitchen with additional seating, perfect for casual dining and entertaining. 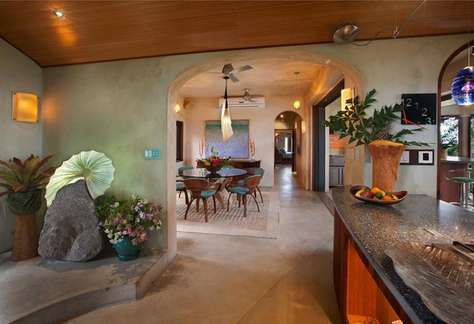 There is a separate pantry with an extra-large refrigerator and ample storage. 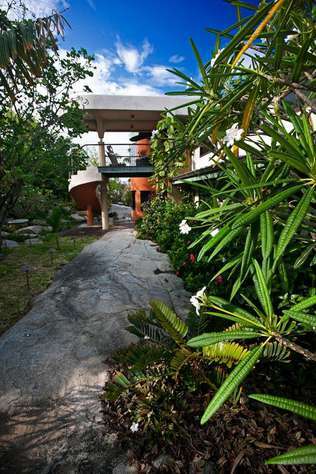 Also on the entry level is The Great Room which boasts over-sized cushy couches with backs that rotate so one can enjoy either the ocean view or the home entertainment centre. 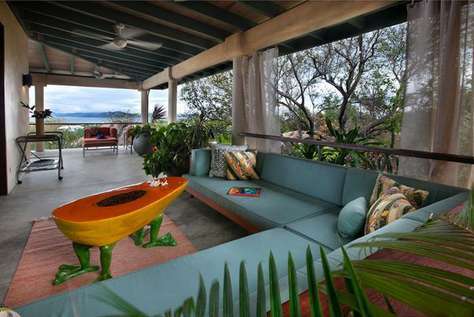 Open verandas surround this level with several opportunities for informal dining and gathering. 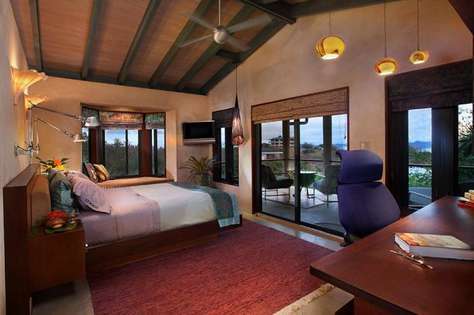 In addition on the entry level is an ensuite bedroom with open-air shower. 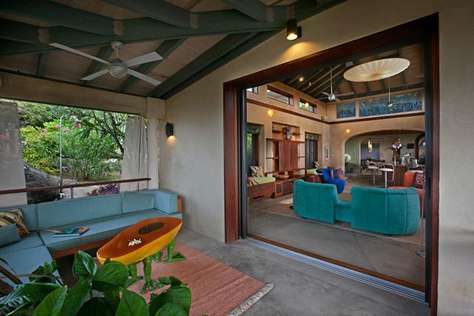 A private covered patio furnished with over-sized lounging chairs allows for perfectly quiet relaxation. 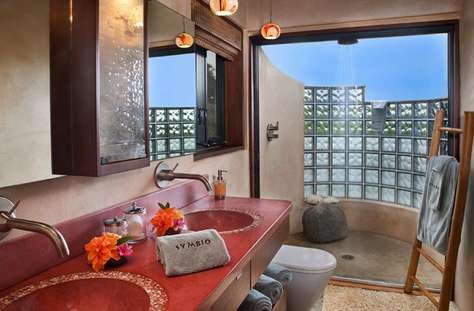 There is also a guest bathroom on this level. 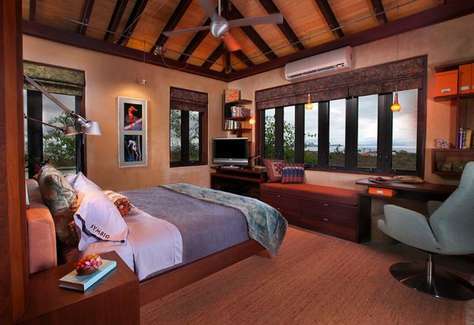 Occupying the entire upper level of this Virgin Gorda villa is the luxurious and spacious master suite. 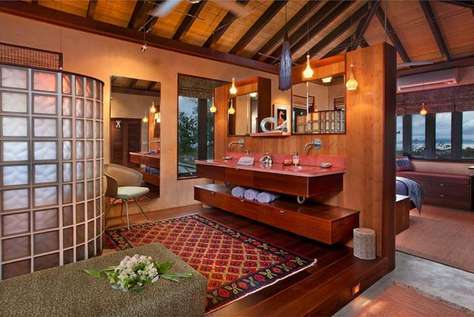 With an open floor plan the king bedroom area flows seamlessly into the ultra-private bath with outdoor shower. 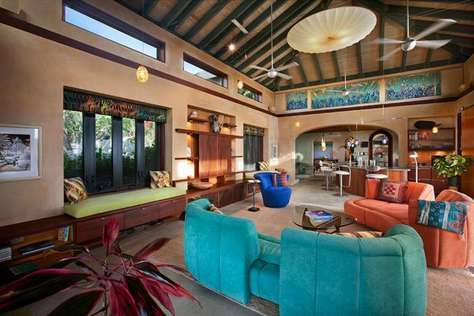 A secluded dining area and accompanying lounge is situated in a cool breezeway. 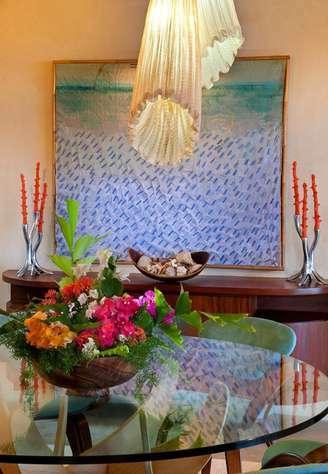 With the constant flow of gentle breeze, it is the perfect place to enjoy breakfast, a relaxing massage or the views of the neighbouring islands. 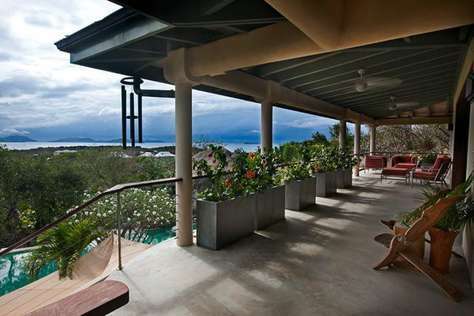 On the lowest level of the villa is a state-of-the-art gymnasium and open-air lounge which joins the pool deck by a wooden walkway. 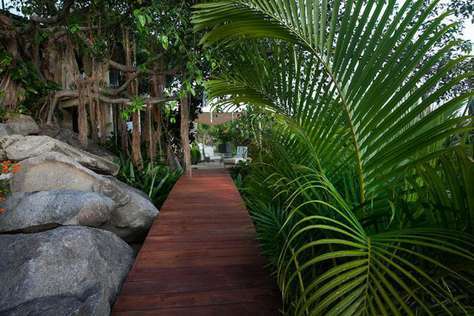 Two picnic areas are set into the well tended tropical grounds filled with Caribbean palms, bougainvillea and fragrant frangipani.